Smart home screens are not a new idea – people have been trying to turn them into traditional monitors built into mirrors, monitors that use E Ink, and more. 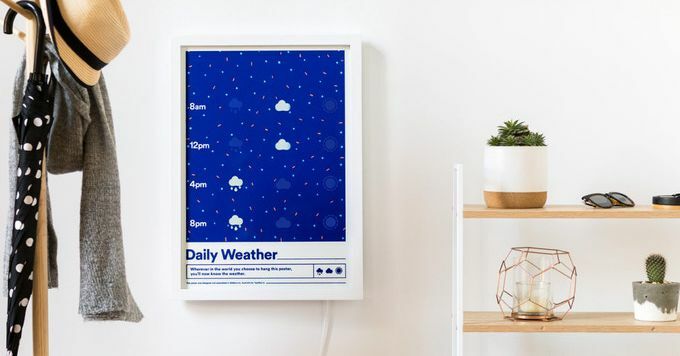 But none of them are quite like Weather Poster, a Kickstarter project by designer Oli Woods and his company, Typified. The project seems to merge traditional art (in this case a screen-printed poster) with modern technology to create a smart display that is more limited in function but far nicer and less intrusive than just hanging a screen on your wall. 1; just a simple icon on whether to count on rain, clouds or sun at 8:00, 12:00, 4 PM and 8 PM for the day – but Weather Poster wins out by looking Like the kind of things you might actually want to hang in your home. The simplicity is part of the charm, at least for me – I can easily imagine hanging one in my apartment hall as both decor and a useful guide to whether I should wear a coat. Woods also does a great job on the technical side: as mentioned earlier, the screen is a traditional paper item that uses heat-sensitive ink to "light" relevant icons using forecast data drawn from the Internet. It's a nice mix of analog and digital technology, even if you can just get the same forecast from your phone. Of course, this is a Kickstarter project, and that means there are warnings. First, the price – Weather Poster is available at an early bird price of $ 134, which is quite expensive for a rather limited forecast unit like this (though it does double as a nice poster). The poster is also the first product from a small, new company that has not yet shipped anything, and the date of July 2019 seems somewhat ambitious. Finally, Weather Poster gets only free forecast data for two years: after that it will have to pay $ 7.50 a year for forecast information. It's not a huge price, but it gives cause for concern that if Typified goes out of business, you will be stuck with a fancy looking poster that doesn't do much at all. It still seems to be a nice idea, and if it is supposed to work, I would be interested to see where else Typified takes his fancy poster concept in the future – imagine a subway poster telling you when your train comes or some kind of paper-based smart watch.